Doing nothing in a coffee shop is a bad thing, because we could ended up buying something other than coffee. That was what happened to me and my friend. 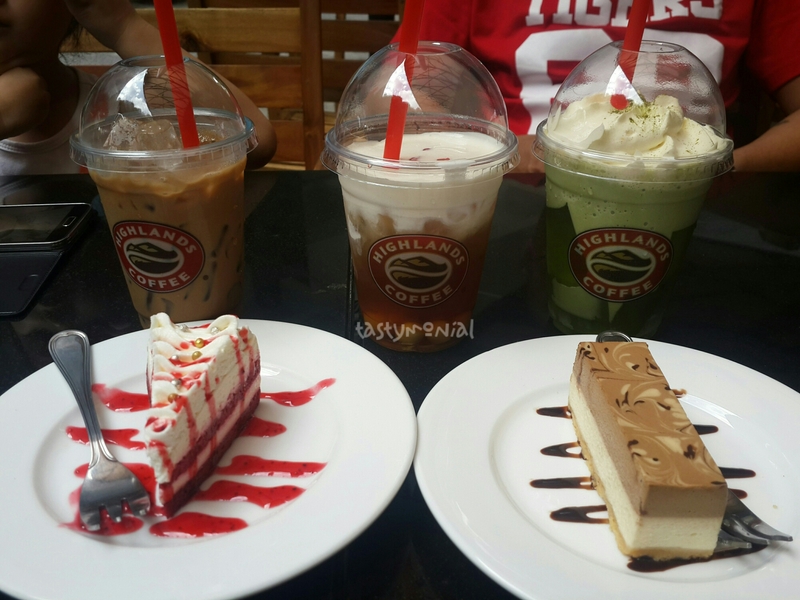 We were waiting for the break time is over at the war remnant museum, and we stayed at highlands coffee. At first, we just wanted to buy a drink or two. In the end, we ordered 3 drinks and 2 cakes! The original plan was to order 1 coffee for my friend’s husband, and 1 tea for her. But then I got tempted to try their freeze matcha (green tea). And to accompany my drink, I bought a strawberry yogurt cake, while my friend bought vietnamese coffee cheese cake for her. Surprisingly the cakes were delicious! I like both of them. The cakes were not too sweet and soft. Very yummy~! I wanted to buy more if I didn’t remember that I just had lunch before coming there. It was a good discovery! Previous Post Banh Mi Huynh Hoa – for meat lover!